It is a little known fact that Central New York State was the leading producer of both hops and beer throughout much of the nineteenth century. Central New York was the largest hops-producing region in the state, and New York as a whole was responsible for more than 80 percent of national hops production in some years, exporting the crop all over the world. Unique histories like this are the types of stories the Onondaga Historical Association (OHA) of Syracuse, New York, likes to illuminate to connect and engage community members with their local history. 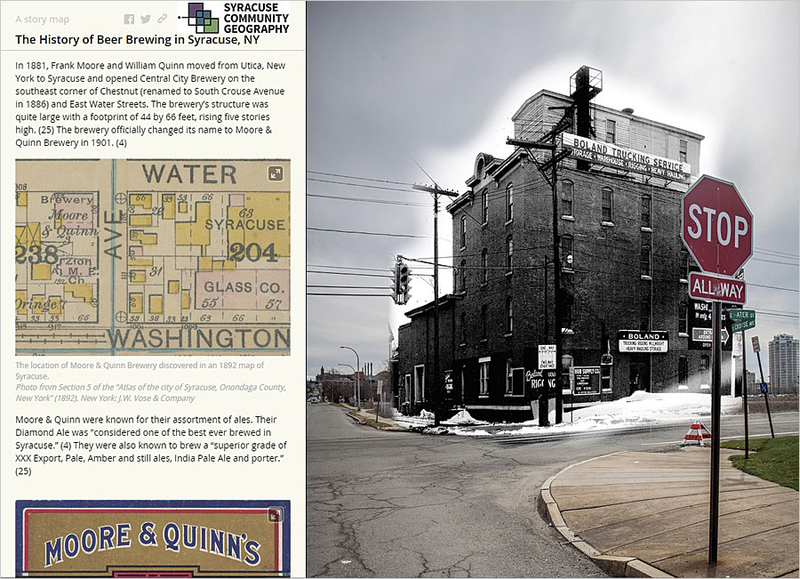 To explore innovative ways of conveying the local history and geography of pre-Prohibition beer brewing to a diverse audience, OHA recently partnered with the Syracuse Community Geography program at Syracuse University, where students used ArcGIS for Desktop and a story map to bring the topic to life. The use of digital composite photography illustrates where the 1881 Central City Brewery would have stood in present-day Syracuse. Established in 2005, the Syracuse Community Geography program partners with community-based organizations to map and spatially analyze topics of interest to the Central New York community. Any community member can submit a project request for GIS mapping. He or she then works with the community geographer and university students to collect, analyze, and map data. The benefits of the projects are twofold: While community partners gain access to GIS and spatial analysis skills and learn the benefits of applying geography to their work, students improve their GIS, research, and critical thinking abilities. OHA, located in the city of Syracuse (the county seat of Onondaga County, in the heart of Central New York), has encouraged residents to explore and appreciate the past for more than 150 years. It has hosted exhibits on topics ranging from the Underground Railroad to the Erie Canal. The partnership between OHA and the Syracuse Community Geography program was a natural fit as OHA began to explore new ways of communicating the region's rich history through interactive, web-based tools and digital storytelling technologies. The Historical Breweries project provided an opportunity to connect students to the local community through experiential learning, while the story map linked an expanding audience of community members to their local history. To reconstruct the beer brewing history, students worked with OHA staff to access OHA's archives. They collected historical images, maps, newspaper articles, books, and government documents related to beer brewing, hops production, and Prohibition. Since one of OHA's major goals was to create a map of the locations of the most prominent historical breweries, the students used historical atlases and business directories to determine the location of each brewery. After accounting for changes in the street network and street names, they found the present-day locations of the historical addresses. Students then used ArcGIS for Desktop to produce a map that shows the historic brewery locations on a modern street grid. Using the new maps and archival images as references, Drew Osumi, a photography student from the university, photographed the modern-day locations where each brewery once stood. He then employed a process called re-photography to overlay black-and-white photos of prominent turn-of-the-century breweries onto his photos of the current locations, painstakingly editing the edges and angles to get the overlays to line up exactly. The re-photography, or digital composite photography, embodied the entire project: It captured the geographic context of the historical breweries and connected them to the city as residents experience it today. What's more, the hierarchical template of the Story Map Journal allowed students to showcase the juxtaposed images and maps as the main features of the story. They complemented them with supporting text and historical images of other aspects of the brewery industry as well, such as beer labels, brewery workers, brewing methods, and historical maps. "It's almost like a little exhibit," said Jon Zella, development associate at OHA. "It allows people to get what they want out of viewing [each] page—a little interactive of the history of brewing history here in Syracuse. If you want to look at photos, that's great. But it also provides more information for those who want to learn more about it." The story map's user-friendly interface made it simple to add sections, edit text, and alter or replace images as well. This was conducive to having multiple students work on the story map over time, making it easy for a student to pick up where someone else had left off. Throughout the research and development stages of building the story map, several interesting aspects of Central New York's beer brewing history emerged. The main elements of the story were German brewers, "hop digs" (post-hops-picking dance parties), beer advertising, technological advancements, brewery architecture, and tensions over the temperance movement. But the team also discovered an alternative explanation for the ultimate demise of the Syracuse brewing industry. While the decline has mostly been attributed to the temperance and prohibition movements of the early twentieth century, student research found that a fungus called blue mold wreaked havoc on New York's hops crops beginning in the 1880s. Reduced cultivation in New York created a gap in hops production for regions in the western United States to fill. Encouraged by the demand for hops and the recently built transcontinental railroad, hops production in the west escalated, and small-scale breweries in Syracuse began to dwindle. Syracuse's prominence in hops and beer production waned and wouldn't see a resurgence for almost another century. Amid the reemergence and popularity of craft breweries and hops farming in Central New York and elsewhere across the United States, OHA wanted to showcase Syracuse's historical significance to the beginning of beer making in America. Using ArcGIS for Desktop, OHA and the Syracuse Community Geography program were successful in creating the first map of Syracuse's most prominent breweries at two points in history—the end of the nineteenth century and the beginning of the twenty-first century. And the use of re-photography gives community members a sense of what the Syracuse landscape once looked like and how it has changed. "In this kind of way, you're actually teaching people about history and industry in Syracuse, and it's something that if they find an interest in it, they can connect with it," said Zella. Additionally, students had the opportunity to connect with their community and local history, and OHA gained knowledge of new tools to make local history relevant and accessible. "It was an interesting approach to research, to put the research into action," added Zella. To learn more about the Syracuse Community Geography program and to view the History of Beer Brewing in Syracuse, NY, story map, visit the organization's website. Jane Mulcahy is a graduate assistant for Syracuse Community Geography. Jonnell A. Robinson is an assistant professor at Syracuse University and the Syracuse community geographer for Syracuse Community Geography.